Our standing as a 2011 and 2017 National Blue Ribbon School of Excellence places us among an elite group of educational institutions to have won the award more than once. 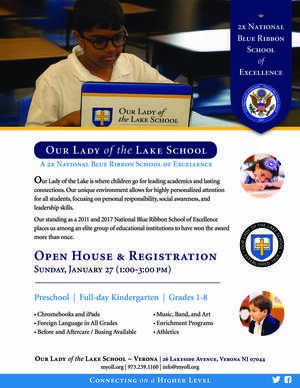 Open House and Registration will be held on Sunday, January 27, 2019 from 1:00-3:00 PM. Register for Preschool, Full-day Kindergarten and Grades 1-8.